Colonial Party Gentlemen's wig. The wig features an elastic band for a comfortable and secure fit to almost any head size and is available in black, black/brown, brown, or white. 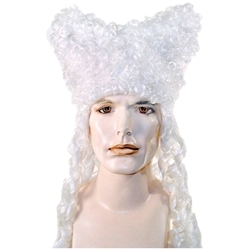 This wig can be used as a unique colonial style wig that is different than the traditional combed back, pony tail look, for Amadeus and Les Liasons Danger. It is also a popular wig for the Fops in Phantom of the Opera.